My life grows more surreal by the day. Four years ago, I was told that my eight year old identical twins have a fatal genetic cholesterol disease called Niemann Pick Type C (the “Childhood Alzheimer’s”) and they would likely not live to see their 10th birthday. Now I have learned from top virus scientists that the same cholesterol gene that is trying to kill my twins – Niemann Pick Type C or NPC1 – appears to be the critical gene that allows a number deadly viruses like Ebola, Marburg and HIV-AIDS to infect humans. Because my twins’ NPC cholesterol genes are non functional, scientists have learned their cells are resistant to contracting Ebola and HIV-AIDS (and probably a host of other viruses that use the NPC gene pathway to infect humans). Read the research announcement here. They actually want to “give” NPC disease for short period of time if someone gets Ebola — turn the gene off temporarily so the virus can’t replicate, then turn it back on. You can understand more about the implications and importance of the NPC gene if you also read the Department of Defense Ebola and NPC announcement. What the DoD did in their experiment is take donated skin cells from NPC kids like Addi and Cassi and they tried to infect their cells with the Ebola virus. What they discovered is that the Ebola virus can’t enter into the cells taken from kids like mine but in healthy people’s cells the virus can enter, replicate and kill. It appears that the NPC1 gene on Chromosome 18 is some type of master controller for many viruses and NPC kids are seemingly protected from certain viruses due to their genetic cholesterol defect. Years ago, a leading HIV-AIDS researcher discovered a similar effect with the NPC gene. His lab reported that the NPC1 gene (and cholesterol) are critical for the HIV-AIDS virus to infect the human cell and replicate. I have been told that Addi and Cassi are likely resistant/immune to HIV-AIDS and probably a whole host of viruses that utilize lipids rafts to do their dirty work in the human body. The emerging Niemann Pick Type C gene and virus story reminds some people of the sickle cell anemia discovery. Doctors found that patients who had sickle cell anemia, a serious hereditary blood disease, were more likely to survive malaria, a mosquito-borne infectious disease that kills millions every year. They believe that sickle cell gene carriers have been “naturally selected” because the sickle cell carrier trait gives resistance to malaria. I wonder what Vincent Racaniello, writer of the Virology Blog, or Ian Lipkin, “the famous Virus Hunter” would think of the Niemann Pick Type C story? Kids dying of an ultra rare genetic cholesterol disease resistant to deadly viruses? There must be some major clues here? I find it interesting that virus researchers are not asking NPC parents like me what viruses NPC kids can contract. It seems like a logical question? For example, the twins contracted Rotavirus at three and they were both hospitalized as a result. Maybe Rotavirus uses a different pathway from NPC to infect people? In 2006, the twins and our family were afflicted with a very mysterious and horrendous virus. The twins and I were sick for many months and I have reported on this widely when interviewed by the media. Since we live between Reno and Incline Village, I believed for close to two years that this virus was XMRV. I had my family tested (we were “positive”). I have since learned that XMRV was due to lab contamination and it looks like we were not positive at all ….. but I am still baffled by the virus we contracted in 2006. Stanford immunologists were baffled as well — they told me it looked like EBV/Mono but they were not positive with the way it was acting over time. You could see increased titers in their blood (which Stanford still has kindly stored for me and it could be looked at today). For the past three years, we have had FDA approval to treat the twins with cyclodextrin (HPbCD), a non-toxic sugar compound that also inactivates the HIV-AIDS virus. Why a single AIDS patients has not contacted me about HPbCD is absolutely mind-blowing since it could be used today as a treatment. If nothing else works, I don’t see why cyclodextrin can’t be tried. HPbCD is similar to Methyl Beta Cyclodextrin (MBC), which was recently reported to kill RSV. The RSV virus discovery was also made with NPC cells — do you see the trend emerging with the NPC1 gene? A 2003 HSV paper shows cyclodextrin can work against Herpes Simplex Virus 1/2. There are many viruses that can be inactivated or cell-entry blocked by cyclodextrin. Basically, any virus that uses lipid rafts for assembly or entry can be blocked by beta cyclodextrin – and there are probably at least 20 virus types that would be inactivated by beta cyclodextrin. I also believe people with these viruses could be treated with HPbCD today – just like my twins. It is quite clear that intravenous treatment with cyclodextrin has had a very positive effect on the twins’ immune system. But no one can tell me why. Whatever virus they had lingering is now gone, and for the past three years, the twins have not been sick. 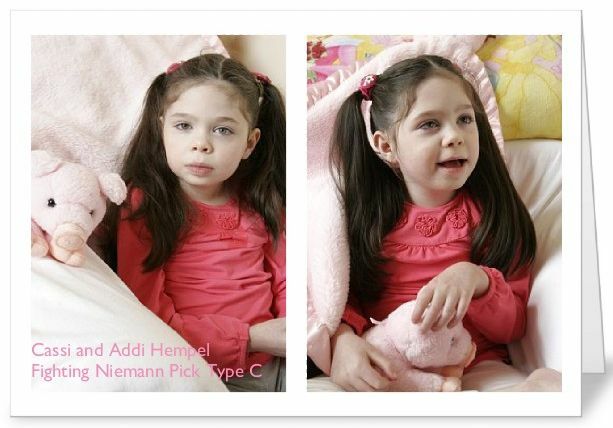 Of course, they still have Niemann Pick Type C disease but they have not contracted anything — no flu, no fever – nothing! It’s remarkable and the twins’ physician will confirm what I am saying about their immune system. Since they are identical twins and both responded the same way to cyclodextrin, we are quite sure there is a biological effect! Just as with the sickle cell anemia story, I feel I am in the middle of an evolutionary detective story. I hope we can get to the final chapter quickly. Why not use those coupons for getting your chosen healthy products. shed weight all over your body to get more visible and defined abs.